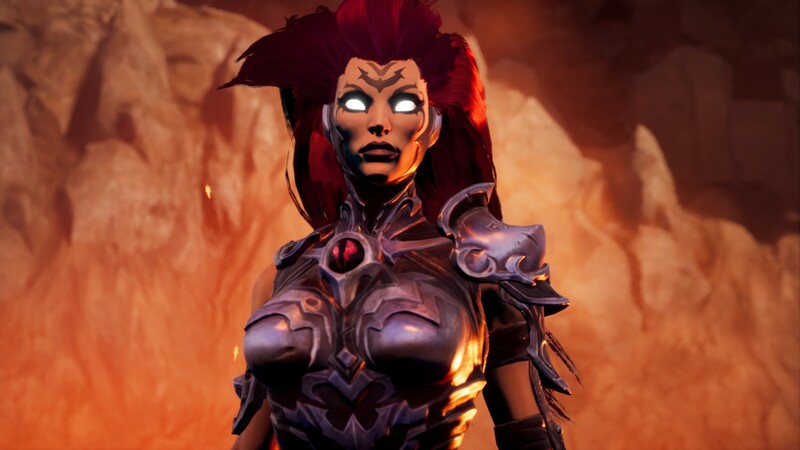 Over the course of playing Darksiders III, my feelings toward it have evolved from disappointment to anger, acceptance, and finally appreciation. Disappointment that it is a slimmer and far less varied game than Darksiders II. Anger on account of the game’s terrible navigation system and wildly varying difficulty. Acceptance that this is not the sequel that I had hoped for. And finally, appreciation for what Darksiders III actually is. 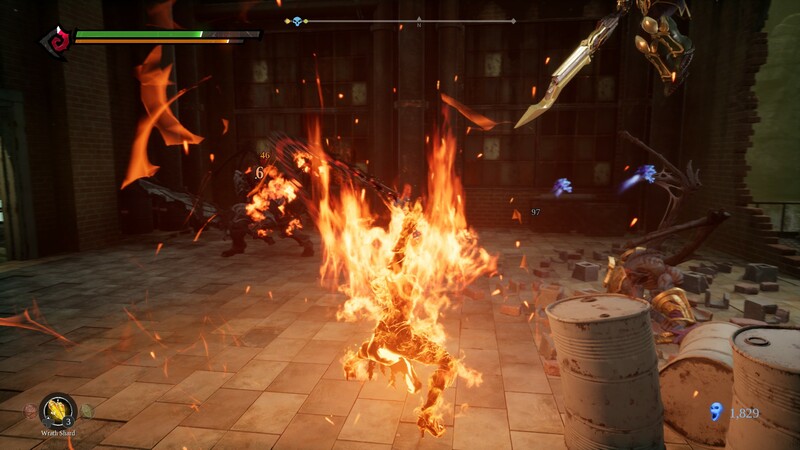 What that is, namely, is a Darksiders take on the Dark Souls format. The sequel eschews the broader scope of its predecessor, which featured horse-riding and complex puzzle-platforming, in favour of a much more pointed focus on challenging third-person combat. It’s an interested step sideways, and I think one that ultimately prevails. 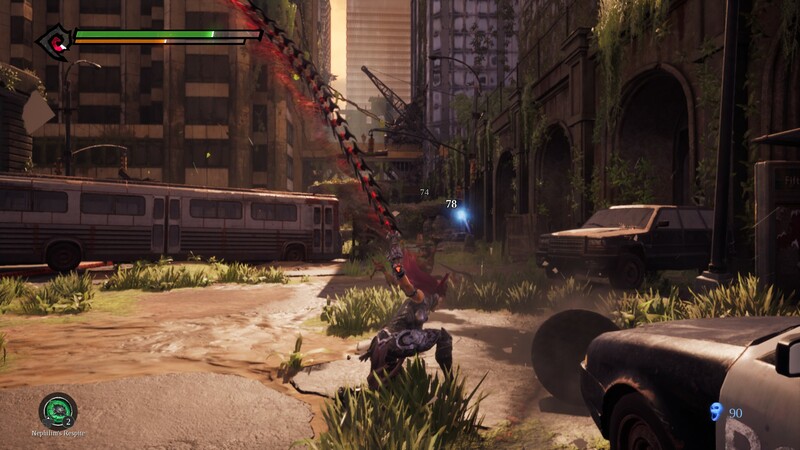 Unfortunately, for quite some time it feels like a step back, and it’s only when Darksiders III leans more towards its origins that the game start to work. Players assume the role of Fury, the third and, in the game’s own words 'least' of the Four Horsemen of the Apocalypse (Darksiders adopting a more liberal interpretation of the horsemen at this point). Fury is also the only female horseman, which makes the game’s whole framing of her as the lowest of the four a mite uncomfortable. Indeed, it’s never properly explained why Fury is viewed in this way, although it might have something to do with her highly uncomplicated view of existence, which is namely to batter absolutely everyone she encounters into a fleshy mulch. Trying to make sense of Darksiders’ story has always been an exercise in futility. The third game takes place after the apocalypse has occurred, in the process letting loose the Seven Deadly Sins upon the earth. With her brother War imprisoned for betrayal, and Death missing in another realm, Fury is given the task of tracking down the Seven Deadly and restoring them to their ethereal state by, naturally, killing them. Above this, however, is some twelfth-dimensional conspiracy nonsense involving the “balance” between good and evil, and ridiculous plots that masquerade in complexity. 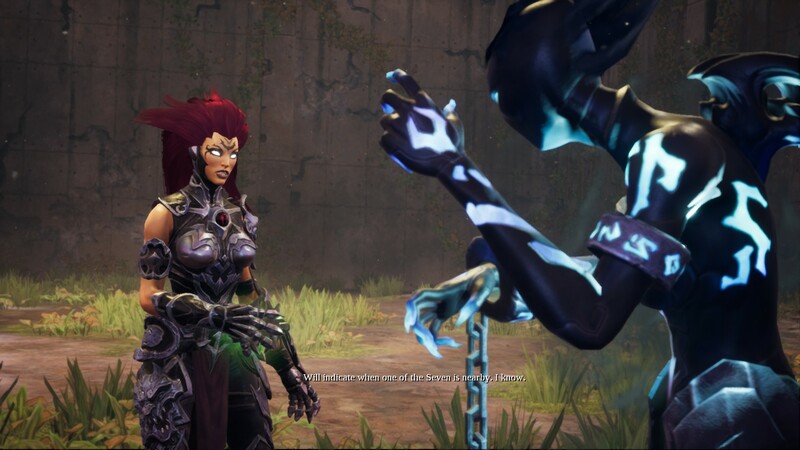 In storytelling, at least, Darksiders III is 100 percent Darksiders, insofar as I had no idea what was going on but was quite happy to go along with it anyway. Darksiders’ stories may be nonsense, but they are generally well-told nonsense, with excellent voice-acting and sharp, sparky dialogue. Fury herself is also a thoroughly enjoyable protagonist, cutting through the web of conspiracy like a knife, always oozing confidence and violent potential. I particularly enjoyed her withering exchanges with her Watcher companion, which keep the game feeling alive while I was navigating to the next boss fight. This is just as well, because for the first couple of hours, the presentation of Darksiders III was all I enjoyed. Like the original Darksiders, Fury is a horseman without a horse, while many other systems features seen in Darksiders II, such as loot and customisable armour, have been excised. Instead, you spend most of the early game running through large, boxy environments, trying to get to grips with the ferociously difficult combat. Fury’s main weapon is a long, serrated metal whip, which she can use to effectively crowd-control opponents. She can’t block enemy attacks, however, and most opponents can kill you in a handful of strikes. Hence, fighting is mainly about aggression and evasion, trying to deal as much damage as possible while avoiding enemy claws and teeth using Fury’s speedy dodge. At first, I hated it. I mean, really hated it. The dodge felt too short, while the fact that enemies stagger you with almost every strike means you really need to avoid getting hit. Compounding my frustration was that I wasn’t sure where I was supposed to be going. Darksiders III is largely a linear experience, but it pretends not to be. The world is highly interconnected, with lots of different pathways that gradually unlock as you progress. Many of these pathways only become usable later in the game, which is fine in and of itself. But the game doesn’t point you to a specific objective. Instead, it points you to the nearest Sin you need to fight, which obviously changes depending on where you want to go. There’s also no map, which doesn’t help matters. Hence, I spent my first couple of hours bouncing in different directions, getting eviscerated by pretty much every enemy I met, and then throwing a small tantrum. Indeed, after about three hours of this, I was ready to chuck the whole experience in the bin. Then I unlocked my second Hollow, and the game suddenly clicked. Hollows are Darksiders III’s central mechanic, and they save the game from being rubbish. These four abilities allow Fury to evolve into different Forms, which is a rather pretentious way of saying her hair changes colour and she can wield a new weapon. But Hollows also provide new ways to traverse and interact with the world. 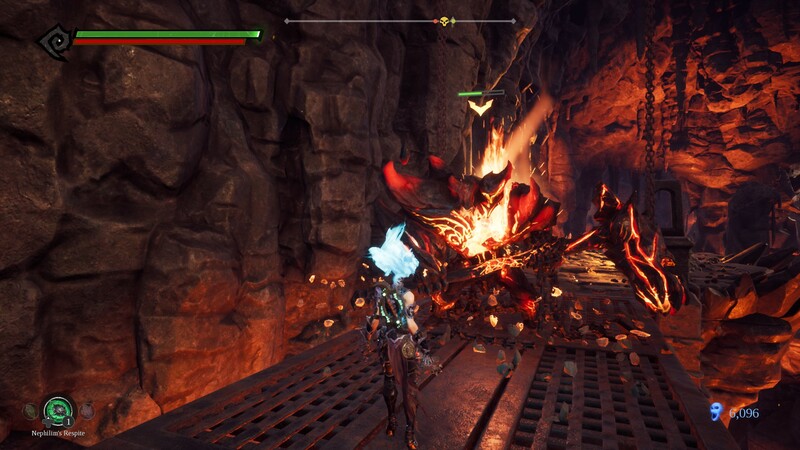 The Fire Hollow, for example, provides a boost to your jump and lets you walk through lava unscathed. The Force Hollow, meanwhile, enables you to run around underwater and magnetise yourself to certain walls. When you unlock the Force Hollow, Darsiders III stops being a mediocre Dark Souls clone, and starts feeling like a proper Darksiders game. The levels become more architecturally ambitious. The puzzles become more interesting, and the combat expands into a system that’s both tactical and spectacular. 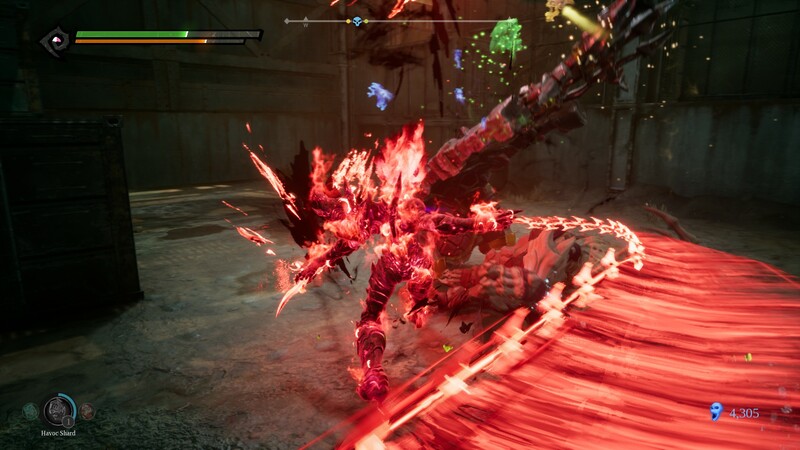 Some of the Hollow combat powers are hugely satisfying. With the Fire Hollow, Fury can set herself ablaze, dealing burning damage to anything that touches her. The Force Hollow, meanwhile, enables her to essentially detonate herself, obliterating any nearby enemy in a big purple explosion. Once all Hollows are unlocked, DarkSiders III becomes a thoroughly entertaining puzzle platformer with viciously satisfying combat. 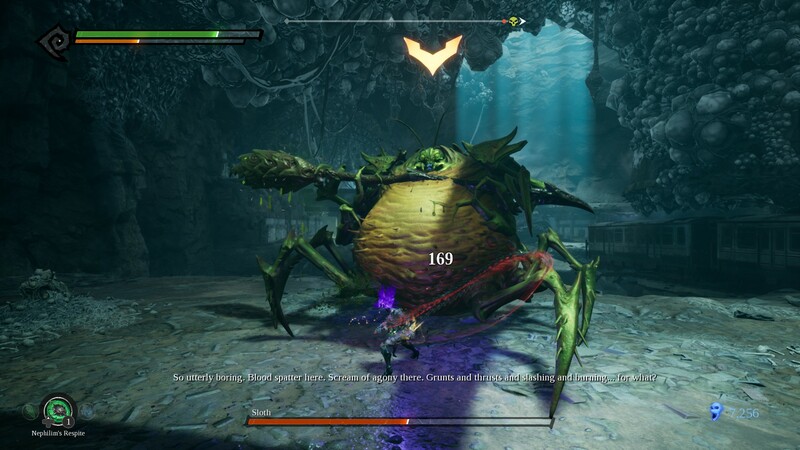 The boss fights are suitably spectacular as well, although they seem to get easier the further you progress into the game. Perhaps that’s inevitable given the way you ratchet up in power as you go along. The game also seems to increase in pace the closer you get toward the end, which also helps this sense of rapidly building momentum. Despite my early frustrations, I was all ready to slap a Recommended badge on Darksiders III. Then I looked at the retail price and…no, just no. Darksiders III is a decent enough hack ‘n’ slash, but it’s not £45 decent, no way in Heaven or Hell. It’s not substantial enough nor interesting enough to command that sort of price. At £30, I’d be more tempted, but £45 is wishful thinking. Still, I’m glad Darksiders is back, and although I was worried for a while that Gunfire Games had fudged it, Darksiders III turned out to be satisfying (if overpriced) virtual junk food. If Darksiders is ever going to be more than that, however, then it needs to do more than ape other games, especially masterpieces like Dark Souls that it has no hope of rivalling. Also, if you’re going to make a game about the four horseman, it needs to involve riding a horse. Otherwise, really, what’s the point? Has original devs on the project. A remastered version of Darksiders 2 for the Playstation 4 has been confirmed by Nordic Games.